You are currently browsing the archives for the HSG category. Today I will talk about why some women go in for an HSG and leave being told the test could not be done. This is such a common problem, and it is usually all about the same thing. It’s about technique. The correct technique makes it easy, a different technique makes it unnecessarily difficult. There are 2 ways to do a HSG. Remember the goal in performing a HSG is to get the dye in the uterus and then have it flow out of the tubes. To achieve this, many doctors slide a catheter through the cervix up into the uterus. This is the problem. If the cervical canal is narrow, whether naturally or as a result of some scarring after surgery, the catheter can’t get in easily. This results in pushing harder, and this causes pain, and pushing harder still may just jam the catheter against the side of the cervix. This leads to failure. The second and easier way, for both the doctor and patient, is to put the dye in a syringe and put a soft cap on the end that snugs up against the cervix. We call this cap an acorn. 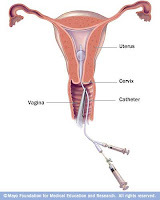 The canal through the cap brings dye from the syringe to the cervical canal and up towards the uterine cavity. Imagine trying to blow up a long skinny balloon by first shoving a straw half way in; it’s not so easy to get that straw through. But if you blow it up by just puffing into the hole (I know some of these balloons are hard to blow up but I’m just trying to illustrate the point) things go much easier. Here are 2 pictures. Each has graphics that are a little different, but they are both drawings of HSGs, both represent a different way to do an HSG. In the first, a catheter has been shoved through the cervical canal into the uterus. You can see the catheter inside with that little balloon at the tip. The balloon is designed to prevent the dye from backing up and coming out of the cervix. This makes sense, but there is a better way. In the second picture, the instrument is just pressed against the cervix, and that blocks the dye from coming out backwards. As you can see, nothing is shoved through the cervix. The dye finds its way into the uterus just from the pressure. Even if the canal is very narrow, it does not matter, because the fluid dye will still have no problem following the path of the cervix. The same is true if the uterus is very ante-verted or retro-verted (tilted forward or backwards), both of which can make it very hard for the catheter to slide through the cervix and into the uterus. I’ll talk more about tilting soon in my upcoming blog about cervical stenosis. I frequently see patients who some to see me having failed an hsg, meaning the test never got off the ground going because the catheter could not get into the uterus. The test was overly painful and there were no results to show for it. All I do is repeat the test using the plug in the second picture and the test easily gets done. Occasionally I need to open the very end of the cervix in the place where the plug goes, but that’s much easier than needing to dilate the entire cervix to accommodate the full balloon catheter. So if you had trouble with the HSG and live around NY, I would be happy to give it a go. Otherwise get the HSG done elsewhere, but ask first if they use the balloon. To be fair, even using my technique, rarely, rarely it still can’t be done and in that case I may need to dilate the cervix in the office or operating room. Thanks for reading and please read the disclaimer from 5/17/06. This entry was posted on Thursday, July 22nd, 2010 at 11:36 pm and is filed under HSG, Uncategorized. You can follow any responses to this entry through the RSS 2.0 feed. You can leave a response, or trackback from your own site.